Uh oh, Samson! Someone's looking over your shoulder! Look out behind you, Samson. Look out Samson! She's gonna pounce you!! Somebody is being sneaky in the background. Yikes! Now turn around verrrrrrry slowly. Samson, can you feel those beams on your backside? Watch out for those lasers behind you! We wanted to stop by and thank you for celebrating our 300th post with us. We've entered you in our book giveaway! Samson, someone's watching over you...Could it be the Catfairy? Samson, look over your shoulder, I think there is a laser cat following you! Samson, there is a little Tortie with big lazers right behind you. Watch out! I see some beautiful laser eyes! Your eyes are glowing! Please tell your Mom that your toys are priority number #1. She should know better! 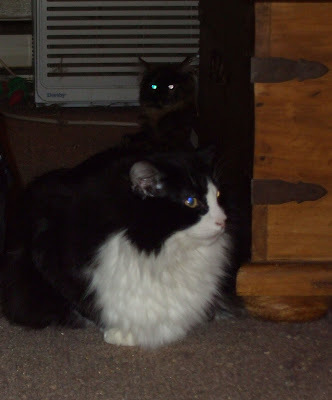 I hate to say it, but Sweet Pea look like quite the little demon creeping up on Samson! Her ears are going flat and her eyes are glowing eerily. I guess there's always a little bit of devil in every kitten. Look out Samson, those lasers are trained on you. Just keeping an eye on things? And keeping an eye on Samson, keeping an eye on things? Such great teamwork. Samson, you may not realize this but you are being watched. Wait, no, don't look, then she will know that you know. We spy a spy in the shadows!